This is a question we all ask and answer... not just once, but many times throughout our lives. Maybe you are at a crossroads. Maybe you just feel like you're life isn't going anywhere. Maybe you are overwhelmed by options. Maybe you feel like you have no options at all. To be uncertain is to be human. But you aren't here for encouragement. You are here to get some answers. So how do you figure it out? How do you know which path you should take and what to do to move your life forward? In this guide, we'll take you through three simple exercises that will help you identify what you should do with your life. A convergence is a place where multiple things meet, intersect, and connect. The Japanese have a simple method to help people figure out what they're destined to do in this world. 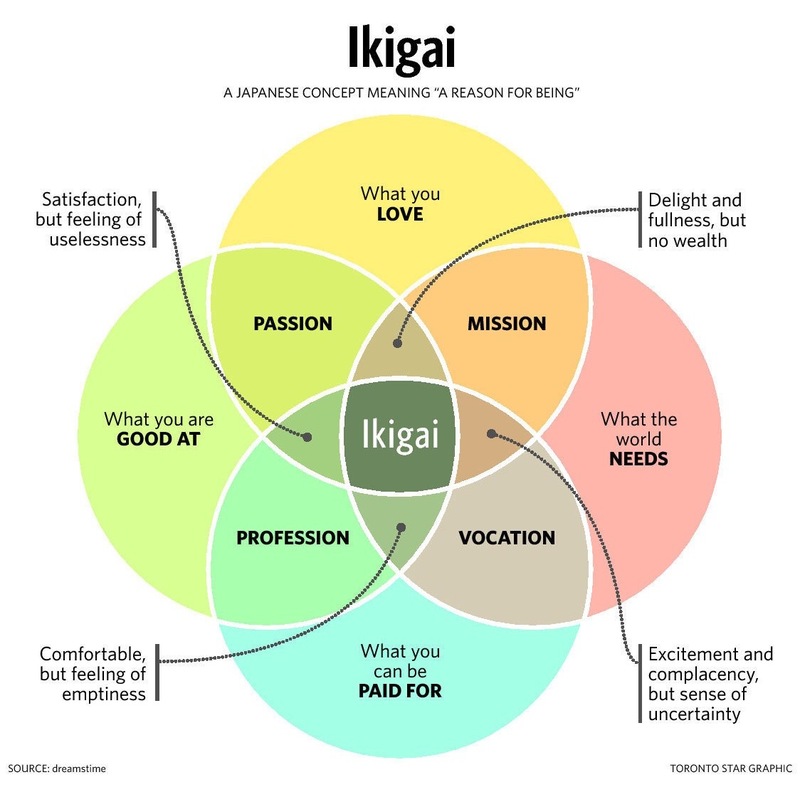 It's called Ikigai (pronounced Ick-ee-guy) and roughly translates to "a reason for being". If you are someone who tends to resonate with an Eastern approach to life, this is the framework you should choose to find your path. Make your four lists, and then identify every possible career path or even broader life path that fits within that convergence. In that case, a viable career path that you identify might be copywriting. Your love for writing and talent for sales could help you get paid well in the marketing industry while you maintain your commitment to honesty in business. Alternatively, let's say you aren't someone who resonates with Eastern philosophy, and you find yourself more in touch with the straightforward rationality of Western thought. Your framework is even simpler. In the West, we tend to measure ourselves based on the value we provide to the market. If the market deems our offering valuable, it rewards us with money, and we consider ourselves successful as a result. 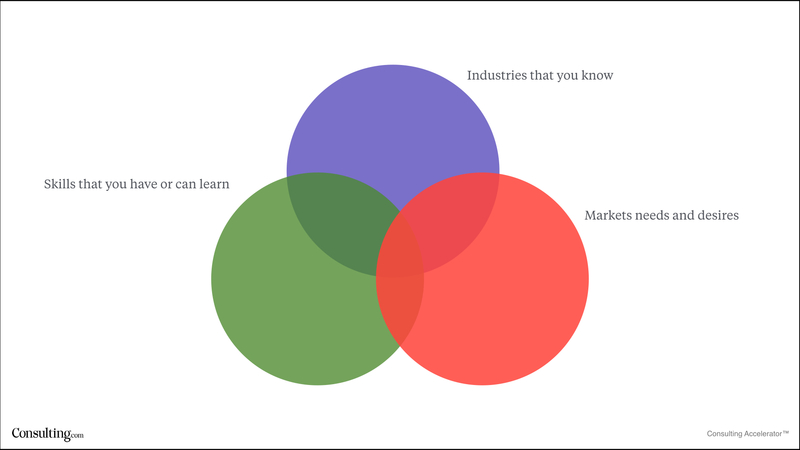 Any career path that combines these three things will let you immediately contribute value to the market and be paid as a result. Whether you use the Eastern framework or the Western framework, your goal is to identify 5-10 possible career paths that you can take into the next section. Deciding what we want can be hard. There are literally an infinite number of options, and as conscious beings, we tend to suffer from choice overload—a cognitive bias in which we become mentally drained when given too many choices. This can lead to procrastination, anxiety, distraction, and a whole bunch of other unhealthy things. Most people have something unproductive they default to when they are feeling overwhelmed with choices... whether it's food, video games, internet browsing, social media, naps, etc. Instead of starting with what we want, let's start by identifying what we DON'T want. Get out a pen and paper or open a spreadsheet and create a column titled "Things I DON'T Want". Set a 5-minute timer and start writing. Here are some examples: "I don't want..."
Once that timer goes off, review your answers and take stock of your life right now. Are you actively experiencing any of these things that you don't want in life? For example, are you in an unhealthy relationship right now? Are you working at a job that doesn't fulfill you or for a boss you hate? Highlight the things you don't want that you currently are experiencing. Additionally, ask yourself if anything you are doing now will lead to something you don't want. For example, let's say you don't want to be chained to a desk for 60 hours a week. Are you at a job where getting promoted will result in you being chained to a desk for 60 hours a week? Highlight the things you don't want that you currently are heading towards via your currently life trajectory. If we don't know exactly what we want to avoid in life, it's very likely that the paths we choose (or the paths we are currently walking) will result in a situation we hate. This is why we start with identifying what we don't want. Now it's time to identify what we want. Starting with what you don't want gets the ideas rolling and limits our options a bit more to combat choice overload. Next, it's time to figure out what we actually want. Forget any limitations like money or time or status in your current reality. If you could wave a magic wand and have ANYTHING you want, regardless of what it is, what would that be? This part can be tricky and requires some self-awareness. What we often truly want isn't what we think we want. For example, you might think you want to be a multi-millionaire, but you actually just want the ability to not be worried about money. This is an important distinction, because the path you need to take to build a multi-million business might include a lot of things you don't want in life, while the path to the minimum level of wealth required to not be worried doesn't entail those things. Similarly, you might think you want to be an entrepreneur, when in reality, you just really hate your boss and want to work for someone better. Entrepreneurship can entail a lot of negatives that you might not want in life, and if you don't understand that, you could end up in a situation where people around you perceive you as successful, but you're actually miserable. Create a new column titled "Things I DO Want". Set a 5-minute timer and start writing. Here are some examples: "I do want..."
Have fun with it and don't hold back! Look for things that really fill you up with passion, excitement, and energy. Don't let a sense of realism get in the way here. Highlight any list items that you are currently living, as well as any items you believe you'll eventually achieve if you continue on your current path. Now that you've completed all three exercises, it's time to put them together to identify what you should do with your life. You should have 5-10 career path ideas from Exercise #1. Go through each path and check off how it performs against your "want" and "don't want" lists. How many "wants" does that path deliver? How many "don't wants" does it avoid? You should notice something by the time you're finished. 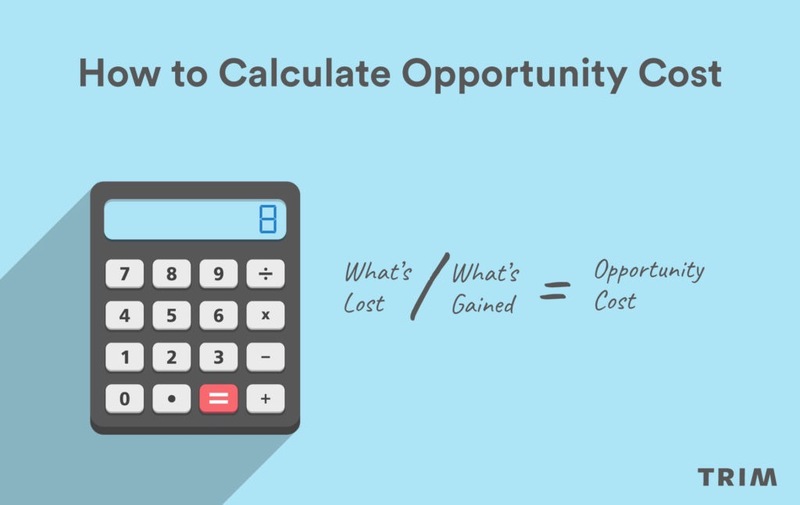 There are opportunity costs that can't be avoided. It's unlikely that a single path is going to give you everything you want while avoiding everything you don't want. Instead, certain paths might give you 90% of what you want while avoiding 50% of what you don't want, while other paths might give you 50% of what you want while avoiding 90% of what you don't want. Which one of these you fall under isn't really for us to say. You know yourself best. You might be worried that you fall under that last category... that getting what you want out of life is actually unrealistic and hoping for something more is going to leave you disappointed. But the truth is, many people find amazing paths in life that give them nearly everything they want while allowing them to avoid everything they don't want. And many others, who don't see those types of paths available to them, go out and forge brand new paths for themselve! Understand that you've been programmed from a young age to default to a pre-selected path. Statistically, you are very likely to follow in your parents' footsteps and do what every generation before you has done. But if you want more, you can go get it. You can take a different path. Hopefully these exercises have helped you begin to answer the question, "What should I do with my life?" This is a question you will ask yourself again down the road... probably quite a few times. And hopefully, each time, you will come back to these exercises. Where is your personal convergence? Your responses to these exercises will have evolved the next time around, and that's a good thing. It means the pathways you identify at the end will be even clearer and more in alignment with what you truly want out of life.